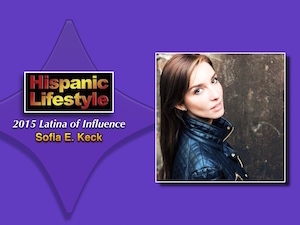 Entrepreneur, Corporate Executive and blogger Sofia E. Keck is a 2015 Latina of Influence named by Hispanic Lifestyle. Sofia is being recognized for her ability to inspire and survive in challenging business climates. Hispanic Lifestyle’s 2015 Latinas of Influence will be recognizing Sofia and her fellow Latinas of Influence during a luncheon held in their honor on at Latina Conference 2015. Sofia E. Keck Born and raised in Guatemala, Sofía Keck is a 33 year-old mother, wife, writer and business owner. Sofía moved from Guatemala to San Francisco in 2005, where she lives with her husband Matt and two children, Mateo who is 12 years old and Avahna who is 6. Sofia’s professional career has taken her down many paths. Most recently, Sofía opened up Los Shucos Latin Hot Dogs, an award-winning restaurant in the Mission District where she serves the famous hot dogs born on the streets of Guatemala. Since its opening Los Shucos has been constantly featured in the media in outlets such as Zagat, Modern Luxury, San Francisco Magazine, SF Gate, The Examiner, 7×7 Magazine and received a certificate of honor from the city of San Francisco. Prior to this Sofia worked in the social media and tech sector, started a Hispanic marketing consultancy, and co-founded Cielo House Comprehensive Eating Disorder Treatment, with clinics located in Belmont, San Jose and Moss Beach, CA. To keep herself busy she also maintains a position as Vice President of Corporate Relations for the Hispanic IT Executive Council, a global organization dedicated to the advancement of Hispanics in technology, and is a column writer for The Hispanic Voice Magazine and for the popular blog American Vida. Sofia holds a Bachelor’s Degree in Economics from the University of San Francisco and studied law at the prestigious Guatemalan Universidad Francisco Marroquin. Sofia is Latina entrepreneur with a diverse professional background and a track record of success.